My 20 years in law enforcement included eight years of serving in the dual role of a reserve deputy sheriff and a department chaplain. During those eight years, I also served for two years as a church planter. These varied experiences allowed me to serve the community and to serve my department in a number of different ways. 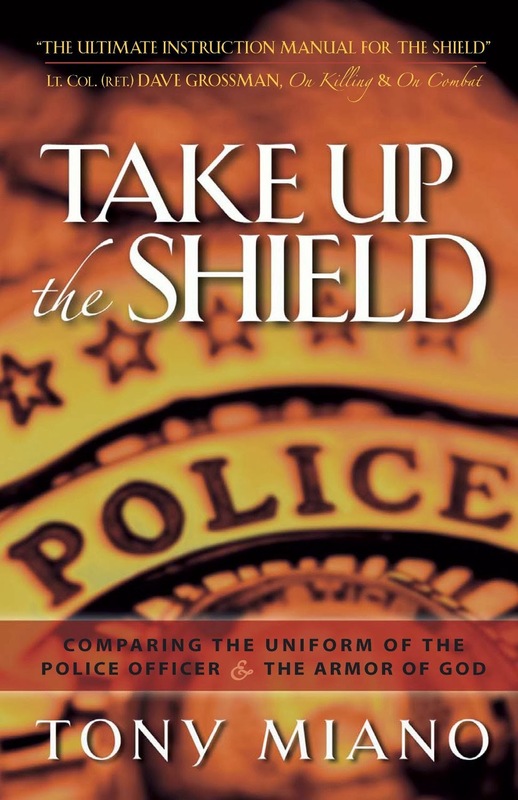 One way was educating pastors around the country about how they and their churches could authentically and effectively reach out to their local law enforcement community. The law enforcement community is a very unique subculture. Law enforcement agencies draw their rank and file from the same fallible human race as every other profession. While a very tight-knit group of people, the law enforcement community can, at times, be a rather dysfunctional family--just like Christian churches. Yes, the law enforcement community is a tough nut to crack. We are not the most approachable people in the world. We trust very few people outside our community. We expect to be lied to every day, and we are. Most politicians are not our friends and only want our votes. We expect the "Right Reverend So-and-So" to grab a microphone, step in front of the camera (or today onto social media) whenever we are involved in a critical incident resulting in the injury or death of criminals and/or civilians. As was proven true on social media and on television over the last few months, the law enforcement community expects some "pastors" to clamor for officers' heads on a platter while these "pastors" jump to every conceivable conclusion except for one--that the officers did the right thing. It happened 22 years ago in Los Angeles. And it's happening around the country today. 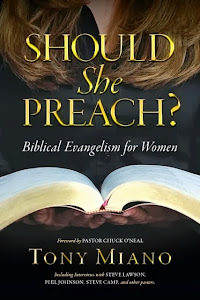 Some "pastors," with their incendiary and often inaccurate rhetoric, have done as much as anyone else to fan the flames of unrest and incite riotous behavior. So, no, by and large, the law enforcement community doesn't trust the Christian community. As they do with just about every other group that, in their minds, appears to be an self-serving agenda, many law enforcement professionals keep the "church" community at arms length. There is an "us versus them," "you're either with us or against us" mentality in the law enforcement community. Some of it's warranted. Some of it is an overreaction. Some of it is borne out of reoccurring bad experiences, survival instincts, and a need for yet one more coping mechanism. There are bad cops. There are men and women wearing a badge and carrying a gun who have no business doing either. They are a danger to themselves and to others, including their fellow officers. While I can think of an inexhaustible list of good officers who are true professionals, brave, compassionate, and sacrificial people, I also have a short list (a very short list) of officers with whom I worked that I would never allow in my patrol car. Either their integrity or officer safety or both was suspect, and that's not how I rolled. But the vast majority of those men and women who choose a career in law enforcement do so for the right reasons. Part of their DNA, although tainted by a sinful nature, is a desire to help people and to serve others. They are, for the most part, Type A individuals. Many of them are natural leaders. Many of them are selfless. Many of them are caretakers at heart. Many are hard on the outside, and tender on the inside. They don't want to hurt people. They don't want to take another person's life. They are not racists. They are not looking to fulfill some kind of twisted need for power. They don't want to oppress people. They are not "good people," in a biblical sense. There are no "good people" (Romans 3:10-18). But, the law enforcement community includes some of the very best men and women the world has to offer. I know them. I've served with them. I've celebrated with them; I've mourned with them. I've laughed with them; I've cried with them. They've driven me nuts; they've blessed my heart. I love them. They are family to me. While many law enforcement professionals are "spiritual" people, the vast majority of them are lost. They do not know Jesus Christ as their Lord and Savior. They are not born-again; they are not saved. The law enforcement community is a large mission field, and virtually untouched by the genuine body of Christ. And while the law enforcement community isn't a "touchy-feely" group of folks, this doesn't mean they are impossible to reach. It takes time and commitment, and lots of both. 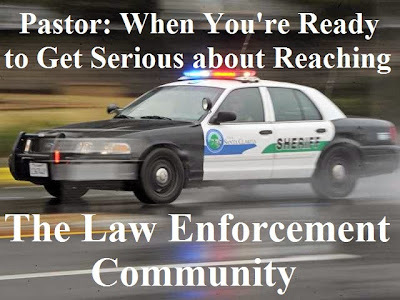 What I would like to do for you, pastor--the man of God who holds the law enforcement in high regard (but not on a pedestal), is give you some practical steps to initiating contact with your law enforcement community, introducing them to your church, and reaching them with the gospel of Jesus Christ. Check with your local law enforcement agency to see if they provide a Community Academy. These academies, often held in the evening and one night each week, over a six to ten-week period, are designed to introduce the civilian community to the day-to-day operations of their local law enforcement agency. Participants are exposed to most, if not all, of the operations within their local patrol station. Participating in a Community Academy is a wonderful way to meet the men and women who serve your community, in a controlled and relatively calm environment. You will learn, by going behind the scenes, just how much an officer does through the course of shift or a week of shifts. Your participation in a Community Academy will also send a positive message to the law enforcement community--one that says you are genuinely interested in those who protect and serve you. Most law enforcement agencies allow civilians to spend a shift in the passenger seat of a patrol car. These visit's to an officer's "office on wheels" is commonly referred to as a ride-a-along. It has been said that an eight-hour shift on patrol is seven hours and fifty-eight minutes of boredom, for two minutes of terror. You just never known when those two minutes are going to come. A ride-a-long is nothing like watching a 90-second video tape on YouTube. It's nothing like reading the tweets from armchair quarterbacks about how officers should do their job. It's nothing like what you see on Prime Time TV or in a movie theater. And what's the difference? A ride-a-long is real. You will spend time with a real officer, in a real patrol car, as he does real police work--everything from vehicle stops, to alarm calls, to domestic disturbances, to other crimes in progress, to the "didn't see that one coming" moments. You will only be "relatively safe" on a ride-a-long, which is to say that while the officer will not intentionally put you in harm's way, he cannot guarantee you will go home at the end of the shift. He cannot guarantee for you what he cannot guarantee for himself. In between vehicle stops and calls you will get to talk to the officer. He won't trust you, at first. He may not even like having you in his unit. You'll get over it. And so long as you don't pepper him with ridiculous questions, the two of you should get along just fine. And by the end of the shift, you will have a new or renewed appreciation for what the officers in the community do for you while you sleep, or while you're at work, or while you're curled up with your family watching Frozen. Many law enforceáment agencies have long-since seen the value of civilian volunteers. Volunteers can be assigned to non-hazardous patrol and station tasks that relieve sworn and reserve personnel to be able to focus on their primary objective--preventing and fighting crime. Volunteers also help the agency's bottom line--the budget. Most agencies only require 8-16 hours each month of their volunteers. Serving as a station volunteer is an excellent way to move beyond the occasional visitor to a friend of the family. The eight years I serve as a department chaplain were the most exhausting, most difficult, and most rewarding years of my time on the department. Granted, I was serving as a reserve deputy at the same time, which afforded me a level of access and involvement that most chaplains don't experience. 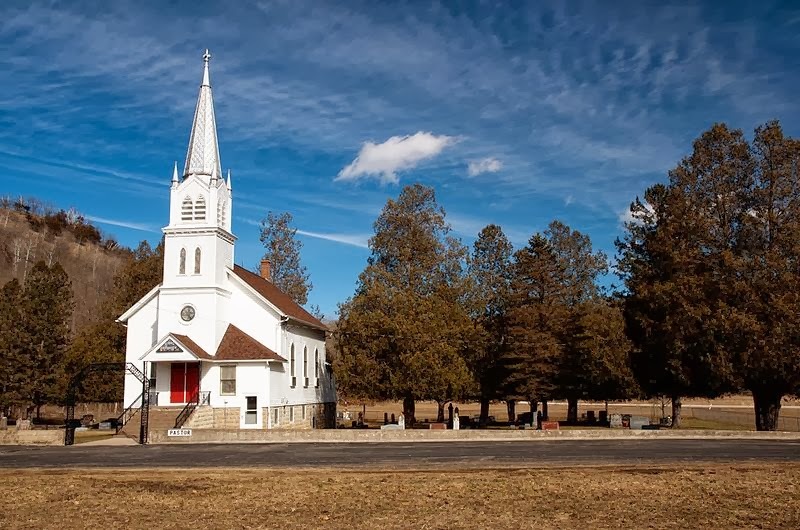 But pastors who are willing to put in the time and effort, will find chaplaincy a very rewarding ministry--one that will lead to gospel opportunities with officers and the community members with whom they come in contact. As with station volunteers, most departments require chaplains to commit to 8-16 hours of service at their unit of assignment, along with a monthly meeting, and some occasional in-service training. Once a chaplain establishes rapport with his officers, and shows that he's at the station for more than next Sunday's sermon illustration, he will slowly be welcomed into the family. Over time, the pastor/chaplain can and often will establish a ministerial bond with his officers that will only be rivaled by the relationship he has with his flock. What I've presented in this article are realistic, practical ways for a pastor to become acquainted with and establish a rapport with his local law enforcement professionals. The question you must now ask yourself, pastor, is, "Am I ready? Am I ready to get serious about reaching my local law enforcement community?" If the answer is "yes," then take that first step, today. If the answer is "no," then I suggest you spend some serious time in prayer and ask yourself why you are not ready to try to reach a significant subculture in your community. Pastor: a word of caution. If your primary mission, your goal, your heart's desire is not to bring the gospel of Jesus Christ to the law enforcement community, please, I beg you, don't bother. The law enforcement community has plenty of psychologists and psychiatrists. The law enforcement community has plenty of unsaved spiritual guides trying to offer my law enforcement brethren Band-Aids for mortal, eternal wounds. The law enforcement community has plenty of groupies. Pastor, if your plan is to work your way into my family's good graces, let your little light shine, while keeping your mouth shut about the gospel, please leave my family alone. Stay away. They don't need you. They need Christ. But if you are a man of God, pastor, who sees that everyone's primary need is Christ and the salvation only He can provide, then I beg you to try to love my law enforcement family. They need the gospel you will preach. They need the Lord you serve. And, while I'm no longer with the government, I'm here to help. If you have questions or concerns, pastor, drop me a line. Great article Tony! I have been a law enforcement officer for almost 20 years. Our department has always had a chaplain program (a total of 3 in 20 years). Although each one of these men are nice, friendly people, I have never seen or heard any example of them preaching the actual Gospel! For starters, I don't think the police Chiefs who hire them are interested in a chaplain who preaches about sin and repentance. They want luke-warm, friendly people who don't cause any contraversy. So what we end up with is nice, friendly men who don't preach the Gospel, who exist so that some officers will open up and vent out their life's problems on. My department is probably 90% unsaved people. They all respect and honor our Chapliain. Its funny to me that the roll call room is full of blasphemy, and dirty jokes...until the Chaplian walks in....then everyone sits up straight and behaves! I guess they think their good behavior will help them out some day! In the end, nothing is accomplished for the glory of God...just re-arrainging deck chairs on the Titanic! The Chief feels good that we have a Chaplaincy program. The Chaplian gives numbers of officers helped statistics to him as well. There really is no true help, so nothing changes. Full time Pastors need to see all thier flock the same way as children of God and especially those that serve to protect us all!